For the convenience of telephone users, an instrument has been devised to take messages and answer calls received when the owner is absent. It consists of a small cabinet containing records similar to those used in dictating or talking machines. If the person is not at home when the phone rings, the instrument repeats a message which has been dictated to it, stating that Mr. So-and-So is out and will the caller speak his message, or any other greeting the owner wishes to give. 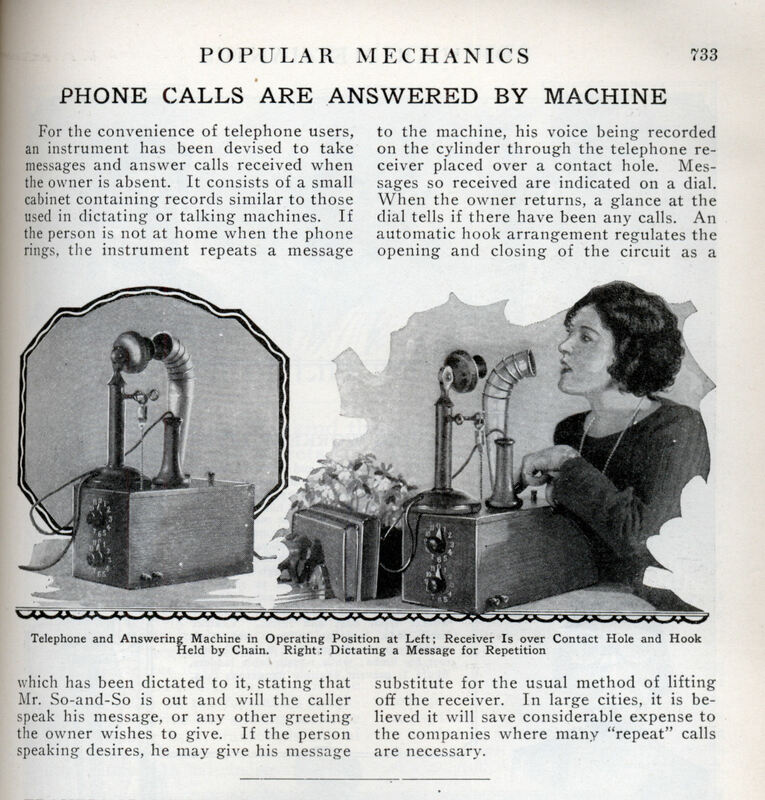 If the person speaking desires, he may give his message to the machine, his voice being recorded on the cylinder through the telephone receiver placed over a contact hole. Messages so received are indicated on a dial. When the owner returns, a glance at the dial tells if there have been any calls. An automatic hook arrangement regulates the opening and closing of the circuit as a substitute for the usual method of lifting off the receiver. In large cities, it is believed it will save considerable expense to the companies where many “repeat” calls are necessary. 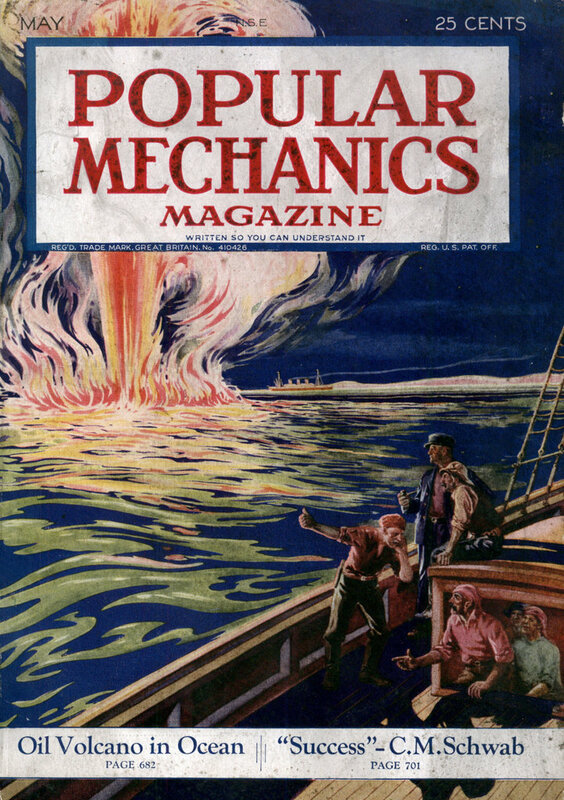 I see stuff in here all the time that was invented way before I expected but 1924!? it is amazing there is nothing new under the sun! At the end of the motion picture “Doc Savage – Man of Bronze”, his answering machine takes a message for the never completed sequel. Set in the late 1930s, the movie shows his “Rube Goldberg-like” answering machine using disks. PS:Wikipedia credits Doc Savage (created in 1933) with inventing the answering machine. PSPS: I seem to recall a late 1950s-early 1960s electronics magazine describe a ‘build-it-yourself” answering machine using small reel to reel tape recorders. Similar to the Doc Savage design. Wow, neat stuff! Hey Jay, I remember “Doc Savage – Man of Bronze” thats the first thing I thought of when I say this post! And notice that this is acoustically coupled: no electrical connection to the telephone line that I can see. I assume there would have been a microphone to place next to the telephone bells, which in those days were located in ringer boxes mounted on the wall or under the desk. When the mic picked up a loud noise it would operate the hookswitch release and begin the process of playing the greeting and taking the message. Since the device would have been purely acoustically coupled, there would be no electrical connection to the telephone line, and thus no violation of FCC regulations (though telcos did attempt to regulate acoustically coupled devices, leading to the Carterfone case that broke the barriers entirely and set the stage for deregulation to this day.